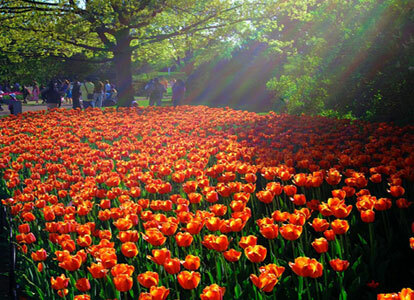 Currently, Istanbul’s gardens and outdoor venues are full of tulips thanks to the Tulip Festival. It is possible to see colorful tulips all around Istanbul’s Emirgan Korusu, the Blue Mosque, the Hidiv Kasrı and at Çamlıca. Even though many people think of the tulip as a flower from the Netherlands, the tulip was originally brought to Anatolia from Central Asia by Turks migrating westward, and eventually to Istanbul when Turks took the city. Turks were cultivating tulips a thousand years ago in Central Asia. The tulips currently, once again, become the sign of spring months. In the history it is also associated with spring.